Macedonia has a long history going back to 1850! 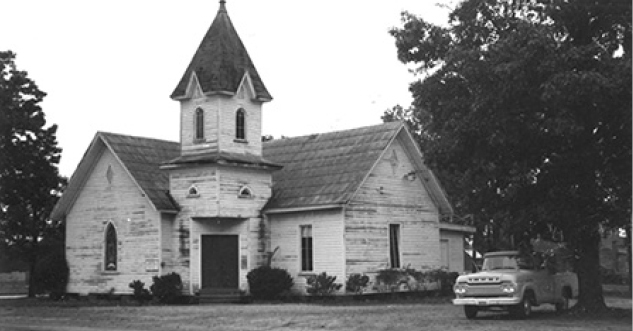 The church has existed in three different locations, starting at the corner of Mid Pines and Tryon Road in Raleigh. The original church site was bought for 50¢ and was built on land totaling one acre. Our church bell from this location now proudly sits outside of our sanctuary as a reminder of our roots in the area, restored by one of our youth members as an Eagle Scout project. In 1906, a sanctuary was built across the street from our present site. The congregation grew, and we moved across Walnut Street to our current location in 1962. In 2005, thanks to many blessings, we were able to add a new sanctuary and new classrooms. The focal point of our sanctuary is a beautiful stained glass window that serves as a beacon of God’s love and grace. The original Macedonians were pioneers who carved a Christian Community out of dense woodlands. Evidence of the hearty people and their rural lifestyles are still present if one looks carefully amidst the forests of new homes that are a part of our ever-growing, ever-changing community.